Home / Mad Meg is back home! 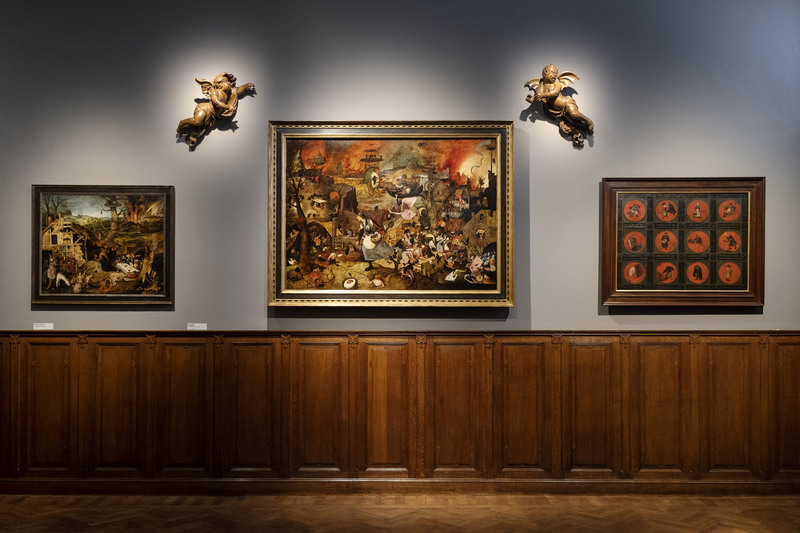 Pieter Bruegel the Elder’s Mad Meg is back home at the Mayer van den Bergh Museum in Antwerp after a two-year absence. Having undergone thorough restoration at the Royal Institute for Cultural Heritage (KIK-IRPA) in Brussels, the painting first travelled to the Kunsthistorisches Museum in Vienna for the major Bruegel exhibition there. Pieter Bruegel the Elder’s Mad Meg has come home. You can renew your acquaintance with the work at the home of its discoverer, Fritz Mayer van den Bergh, where it will be on prominent display once more as one of the museum’s star attractions. Previously known as a dark and weird landscape, with a deep-red sky and touches of brown, the painting looks considerably fresher since its restoration. The yellowed layers of varnish and later overpainting have been removed and the splendid original colours are back. The palette of colours has become brighter and more varied, and the panel reveals details that were long invisible, such as the teddy bear, the finely executed helmets and the magnificent landscape in the background. Bruegel’s brushwork and exceptional painter’s talent are visible once more. The sense of space has been restored and the scene as a whole displays a much clearer effect of depth. Beginning on 5 October 2019, Mad Meg will be the central focus of a new exhibition at the museum, at which visitors will be able to immerse themselves in the world of the nineteenth-century collectors Fritz Mayer van den Bergh (1858–1901) and Florent van Ertborn (1784–1840) – the figures behind the collections of Antwerp’s Museum Mayer van den Bergh and the Royal Museum of Fine Arts.